Straight pour from 350ml can to a large wineglass (because who knows, maybe it’ll actually make a difference). Freshness date of September 24, 2012 clearly printed in black ink under the kick-up of this can (“11:32 L 6230565 VAL : 24 09 12 RJ”). Appearance (3.0): A solid finger and a half of crackling white bubles rises quickly, topping a perfectly clear, pale golden body, but soon fades to a thin haze. No lacing to speak of, but it does kind of suds-up nicely on the swirl (yes, I swirled it in my large wineglass). Smell (1.5): This gives off an odd, pale, fruity character that’s reminiscent of a packaged fruit cup where you’re not actually sure what fruits the chunks you’re eating came from. But a diluted version of that. Nominally bready, I suppose, and mildly vegetal. Taste (1.5): Whoa, really f’ing hoppy! Just kidding. This is about what you’d expect: the malt character is not bready and grainy so much as it is moderately vegetal, along the lines of boiled corn, lima beans, and canned peas. It does have a slightly bitter finish, but the herbal bitterness slides into that odd vegetal character to create a faintly sour finish that is not a ton of fun. Mouthfeel (3.5): This does have fairly decent carbonation, offering a pretty active display of foaming on the swallow while making the tongue tingle the whole time. Finishes pretty dry, and is definitely light in body but not as watery as a lot of other macros. Overall (2.0): Well, in some regards (mouthfeel, appearance), this is slightly better than other Brazilian macros. In other regards (smell, taste), this is no better than the average piss-water macro. But, it is what it is. Drink it as cold as possible on a hot day, and it will be appreciated exactly as it was meant to be—and not without reason. Otherwise, don’t bother. There are better examples of the style native to Brazil. A- Nice head, minimal carbonation. Golden body with a nice lace on the glass. S- Nothing! A little veggies maybe. T- Very little except the rotten metal veggies. M- Very light and clean because of the big carbonation. D- easy but not worth drinking. Nova Schin is like any other big macro pilsner beer. Pours golden clear with good carbontaion that provides an intial froathy white head that dissapates quickly. The smell and taste are bolstered by grain with some hop in an effort to balance the beer. This is a standard no-frills beer. Drink it cuz its beer. Poured a 2 finger head. Very pale yellow color. Good carbonation. Aroma was very faint, it took me some time to identify some corn. Light body, as light as possible before considered plain water. Mildly sweet, felt mostly non-barley cereals. A hint of bitterness (positive in comparison to some peers). A little dry ending. When it warmed up became New Iron Schin given its metallic aftertaste. Just another SAL mass market beer. White head crackles, lacing drapes the glass and clarity shines. The aroma is reminiscent of crisp dumpling dough from the malt and lemon zest from the hops. Obvious Pale Lager crispness dressing a light body. Thin malt is a given, but there is enough to keep this beer together. Aftertaste is clean enough to want to take another sip. In the realm of mass-produced Pale Lagers, this one sits in the middle. Sure, it does its job ... refreshing and drinkable, but there is not much to really talk about other than it is just a plain Pale Lager. The ho-hum side of beer. 12 oz brown bottle with a freshness date on the back label. Pours a thin spritzy lace, very pale color with a bright clarity. Watery hay like graininess in the nose, muted hops as well. Wet on the palate and light bodied as well. Solid crispness. Clean on the tongue with a faint maltiness that leaves a dry grain husk character in the finish. Middle of the road mass-produced lager ... nothing more. 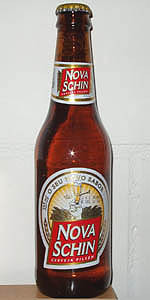 Nova Schin Pilsen pours a crystal-clear, very light straw-gold body beneath a bright white head of creamy foam. The head retention is surprisingly good, and it leaves some nice lacing about the glass. The nose is slightly odd, but not really off-putting. It's mild, but there are notes of candy and wet tobacco there. Fortunately it's just slightly floral as well, and that helps to balance it a bit. It's gently crisp in the mouth with a median carbonation and a dextrinous, if that's possible, light body. The carbonation releases easily, and it becomes a bit airy and smooth as it warms across the palate. The flavor explains where the candyish note comes from in the nose, as it's kind of sweet, and not particularily grain-like. And the wet tobacco note may be coming from the dull, muddy, herbal and leafy hops in the underlying background. They're there somewhere, but you can't really pick them out through the sugariness of the malt (if we can call it malt). Bitterness is limited in the same way that the hop flavors are, and the candy-like sweetness carries over into the finish. It's not cloying, and it fades within a moment, but it leaves the beer with an overall stickiness. Clearly brewed for those that enjoy beers without any hop flavor or bitterness, I'd imagine that this might do very well with the younger "disco" crowd (18-25). This beer pours a crystal clear, almost dull white, yellow body with a small white head. Nose is pretty nondescript. Simple macrolager. Taste is light bodied and pure watery macro lagerr. Light malt, no hops, no need for bitterness. Lawnmower action. This is my first Brazilian beer and I gotta sya, it was exactly like I immagined, dumbed down corona type pilsner. Hmm. This recently launched beer has become uber-popular here for reasons i cannot begin to understand, must be the ads. It pours a very thin yellow color with a medium forced carbonation head that quickly disappears. Has a faint aroma of adjuncts. Tastes virtually like water, i swear the IBU's have to be around 2 for this beer. Body is very light, i guess that's why i always see people pound these beers down, but on the upside at least it didn't have a bad taste. Not only did this Brazilian (!) beer come in a CAN, but it also had an aluminum foil cover over the top of the can to keep it from gathering dust or what-not. No matter, I still made like a raccoon and rinsed it off. CAN you dig it? I got a finger-and-a-half of bone white head with decent retention off of my pour. Color was a light golden-yellow with NE-quality clarity. Nose smelled like cereal. Aw, come on, fellas! Doesn't anybody have any imagination?!? I am tiring of CANned beer after CANned beer being just filled with adjuncts. No wonder CANned beer has such a bad reputation. Mouthfeel was medium with a more characteristic lager sweetness than I might have expected from the nose. Finish had a slight sulfur characteristic but again, not anything that I could not overcome. It was better than some, less than most and since it was in a CAN, it merited a try. Sweet can with foil covering the top. Clear and straw yellow, there was a thin cap of bright white foam covering the beer for a few minutes, supported by constant bubbling. A bit of lacing. Not bad. Light aroma, notes of corn and grain along with herbal/grassy hops. Bitterness was nearly absent and made the beer sweeter than it needed to be. Hops were pulled way back as well. Slight mineral/metallic flavour. It reminded me a bit of candy with a grainy aftertaste. Thin body with fizzy carbonation. Not much to recommend here. Decent little summertime beer. Opens with a typical straw color, perhaps a bit on the light side. A somewhat fizzy carbonation produces a spritzy head that could use some staying power. The beer has a protien haze and 'clouds' of coagulated protiens floating about. Perhaps the beer had been sitting around for a bit too long. Aromas are freshly malty with hints of grain, lemon, grass, and yeasty breads. Flavors do much the same, but emphasize the acidic lemons, apples, and fully attenuated pilsner malts. As the beer warms, light vegitable taste and aroma gains intensity but never overwhelms. Textures also pick up on the acidity and the scrubbing carbonation. This does give a clean palate with every drink which I find refreshing. Alcohols give a light mint flavor and cooling that extends well into the finish. For what it is, I thought it was a pretty good beer. appearance: There's a low, white head that completely recedes. The beer is a clear, pale golden color. smell: First, a sulfuric noble hop aroma dominates. Some pale, bready grains and rice come in later. mouthfeel: The carbonation is on the lower half of the high range, and the body thin. taste: Very watery and bland. Some pale grain sweetness is found, but mostly just watered-down adjunct flavors. Very slight, dirty hop flavor, and just a touch of bitterness in the watery finish. A hint of sulfur. drinkability: Water is drinkable, so it follows that this is. Still, it's so drinkable that I have to give it a 3.5.